Trying to figure out the social media accounts for many trademark brands is easy; just preface their name with an “@”. For example, @Apple is Apple Computer (not that the company uses that account), @Dell is Dell Computer, @MTV is, well, MTV, @Visa is the credit card, and so on. @Monster, however, is not Monster Energy, but the job and career Web site Monster.com. There are also a lot of companies that have dozens of Twitter accounts, like Procter and Gamble, that has just about every one of its home product brands (like @Tide and @Gain detergent and @Pampers diapers) registered on Twitter. It’s complicated! If you’re paying attention to logos then you can see @MonsterEner… but does it end “Energy”? Or something else? In fact, as you can see, Monster Energy is known on Twitter as @MonsterEnergy. 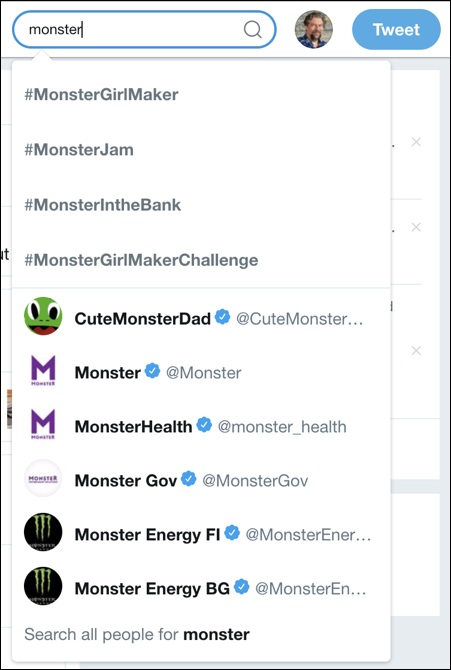 But there are a bunch of other accounts Monster Energy has too, so check all your results to see which is the best for you to try and communicate with the social media team. And good luck to you! Pro Tip: We have a ton of Twitter help on the site. Please check it out while you’re here, and don’t forget to follow us on Twitter too: @DaveTaylor.